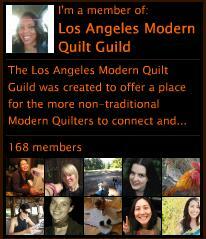 ← LA Modern Quilt Guild! Our first meeting! Falling in love with solids. . . So, I found out my college friend Tommie was getting married to his long time girlfriend – just a month before it was supposed to happen! I knew I had to make a quilt for them. 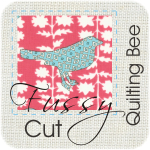 (I really just need an excuse to justify making another quilt. But, shhhhhh, don’t tell anyone!) Anyhow, for some reason I got it into my head to make it in the wedding colors which were brown and teal. These are beautiful colors but, I had the hardest time in all the world finding prints in these colors. I was looking for prints because I knew I had time constraints and wanted to do a super simple pattern like snowballs or something. 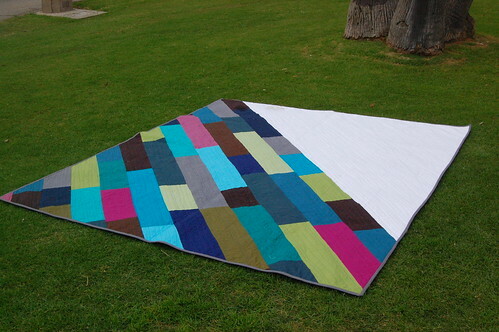 So, I resorted to using solids – Kona solids – and unexpectedly fell head over heels in love with solids. OMG, there are so many shades and when you mix them all together – wow! In any case, I started with browns and teals and then I added turquoises and blues and tans. Then I knew I had to have a little contrast so I added some greens and pinks. . . And boy was I happy with the results. I don’t even want to send it off now. I guess I’m going to have to make one for myself too! I was trying to make something more fancy than just squares – I don’t know why I had the snowball pattern in my mind but, in the end I didn’t want to break up the beautiful solids. So I made something REALLY simple. It’s just 10″ squares so I guess the final size is about 80″ x 90″ (I haven’t actually measured it). I quilted it really simple with random “fairly” straight lines at various angles. 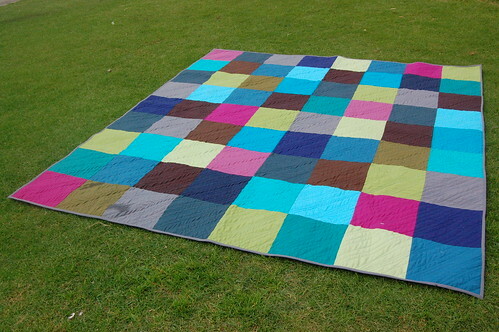 So, now I’m obsessed with solids and have already picked out my fabrics for my next project – wonky circles out of solids! Yeah! I’ll show you a sneak peek soon. Oh, I love these solids. This is so great. So bright and colorful . . . Well Done! This is fabulous! 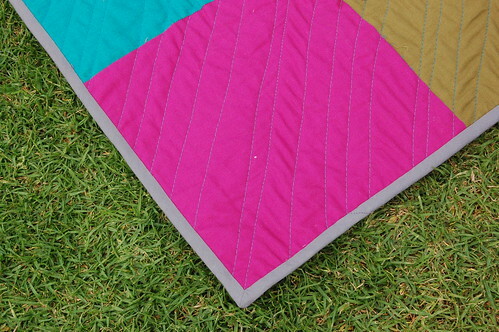 I’ve been thinking about doing a solids quilt myself for a while – thanks for the motivation to just do it!